Over 40 major canvases from 2000 to the present will be the focus of this first major museum exhibition for this young artist. The son of an art critic in San Juan, Perez was versed in art history and modern art as a youth. When he arrived in New York in 1986, he aimed to perpetuate the progress of painting as defined by Modernism. Simulating the silkscreen technique of Warhol's paintings, Perez developed a complex painting process using layers of paint transfers to create evocative portraits of young, beautiful women, tropical still lifes, and renderings of modernist architectural icons. All of these paintings were based on picture post cards or the artist's own photographs. Although he approached the photographic subject like a readymade, he was drawn to these images for their emotional charge and as metaphors. His paintings of famous New York modernist skyscrapers hauntingly evoke a mid-century optimism that vanished after 9/11. Despite their representational images, these canvases also function as abstractions in which the artist indulges in the process of painting. 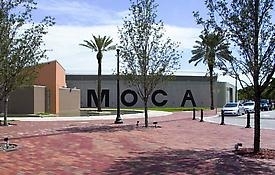 The exhibition is organized by MOCA and curated by MOCA executive director and chief curator Bonnie Clearwater. It will be accompanied by a full-color catalogue.